Last summer I noticed Newt developing oozing sores on the front of his pasterns. 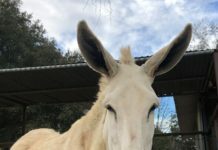 They were kind of like "scratches", a superficial dermatitis, except the lesions were on the front of the pastern instead of on the back. They did not seem painful to Newt, and they cleared up in a day or two with just Betadine scrubs. Then, I finally figured out these lesions seemed to develop a few days after we trained in a certain pasture. Living in South Texas, it seems as if all of our plants and insects have multiple ways to either stick, poke, or sting you. Keeping that in mind, I checked this pasture for bugs or plants that might be causing these lesions. It did not take to long to find the culprit. Huisache thorns! The pasture had been shredded over the winter. When we finally got some rain in the spring the thorny huisache bushes sprouted again. The plants were small enough that we never noticed them as we were trotting and loping through the pasture. Notice the small thorn. It is just barely stuck into the skin, just enough to cause some mild irritation and inflammation. I needed some kind of protection for Newt. 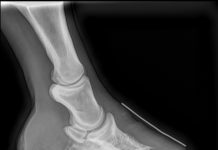 Splint boots do not cover the pastern, and bell boots sit too low to cover his pastern. I started using our Glove Back Country boots. They covered about half of his pasterns. After several rides using these, we have had no more lesions. 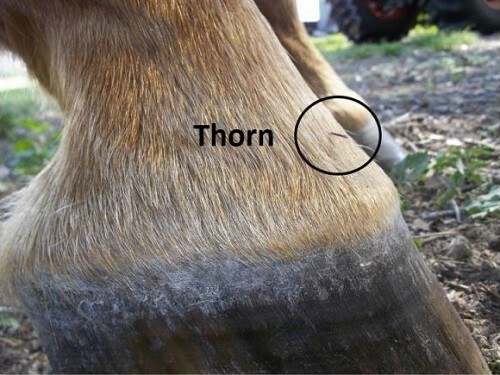 Not only do the boots protect the hoof, they also provide great protection to the pasterns from thorns! Close-up of a young huisache thorn bush. It is just the right height to stick into the pastern as we are trotting through the pasture. 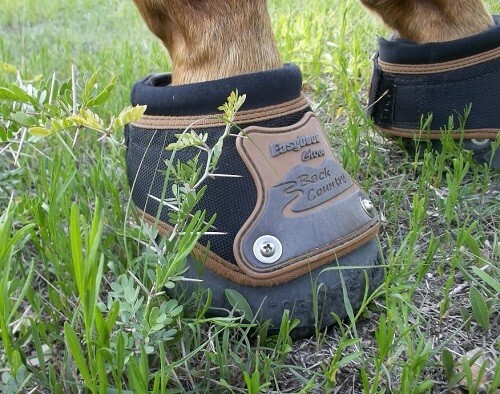 I also like using the Back Country boots when I have to haul Newt in a trailer with other horses. They provide great protection to the coronet band. How many times have you heard of horses stepping on the horse next to them (or themselves) and damaging the coronet band? 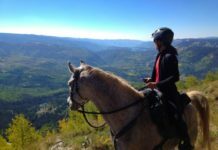 The Back Country boots are better and easier to apply than shipping boots, and when you arrive safely, you are ready to ride. 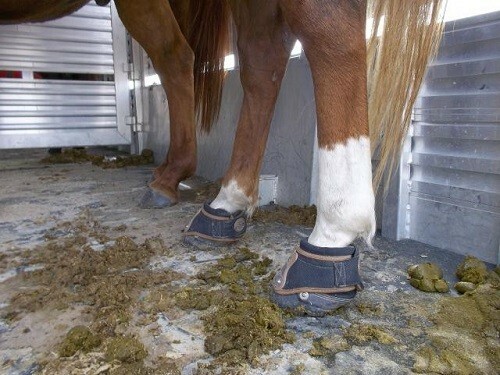 Newt wearing his Back Country boots for protection in the trailer.